The groundbreaking release of the 09-engine powered KF-01 formula racer in July 2010 started the continual evolution of performance as each machine challenged for dominance of the F-GPX series races that spread across the globe, just like the original formula racing machines. 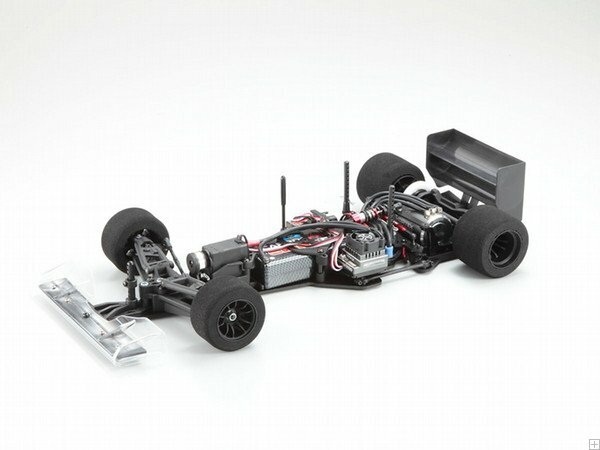 From the other side of the spectrum, the 1/12 Plazma Ra sparked a revival in electric car racing in 2012 with dynamic performances earning it recognition as a trend leader in electric competition models. Now the technological strengths of these two machines have forged into a competition-level electric model, set to dominate formula racing. The simple, slim and sophisticated design incorporates the stacked battery layout and the proven center pivot and rear side link suspension of the Plazma Ra within similar dimensions of the KF-01. The pitching shock with diaphragm maintains constant volume and combines with a friction tube roll damper to deliver rock-solid stability. 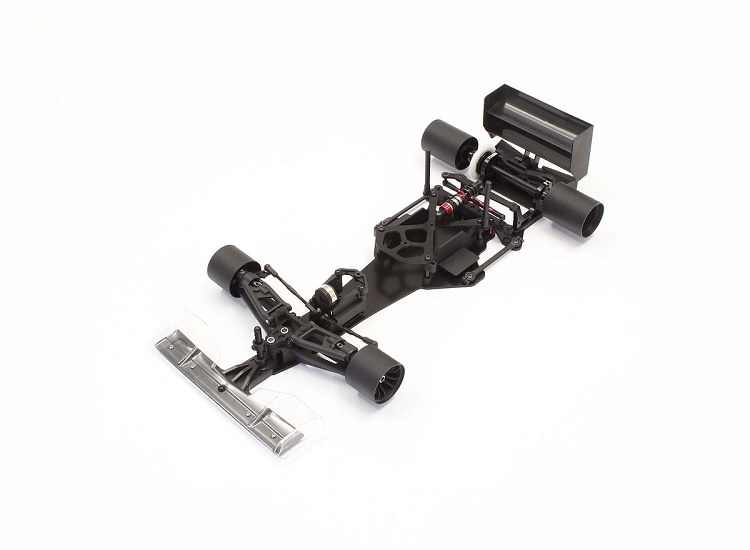 Features suspension arms with wraparound 6.8mm ball ends that allow fast camber adjustment during racing. Incorporates the Plazma Ra’s advance design featuring 3 stepped caster adjustment with suspension holder spacers and king pin coin springs. Design of the ball differential does not distort the differential setting when replacing tires. Equipped with a large plastic diffuser that can easily be removed for a different driving feel. Plazma Ra’s rear suspension with center pivot and rear side link controls roll and pitching direction. Front wing combines a strong base with lightweight polycarbonate. Uses strong FRP such as the main chassis plate. External sections are anodized in black while the pitching shock and side link are anodized in Kyosho’s signature red color. Suspension realizes stable performance through the front strut/center pivot and rear side link. Front and rear side springs provide reliable coil spring effect. Optional springs from the Plazma Ra can be used to fine tune your setup. Features pitching shock with diaphragm and friction tube on roll damper. A kit is a higher level vehicle that includes nearly everything you need to build a rolling chassis. You will need to supply items like motor, ESC, battery, tires, body and radio equipment. Required items may vary from kit to kit so please see Required Items For Completion section for full list.